Ulleung County Gov. Kim Byeong-su said all-out efforts will be made to transform the small island in the East Sea into a world-class ecotourism attraction in 2019, driven by a newly opened road along the coast and cultural heritage preservation. The 72.86-square-kilometer small island, located 178 kilometers east of Gangwon Province, is vital for South Korea, as the county oversees the diplomatically significant island of Dokdo and 42 other islands. Gov. 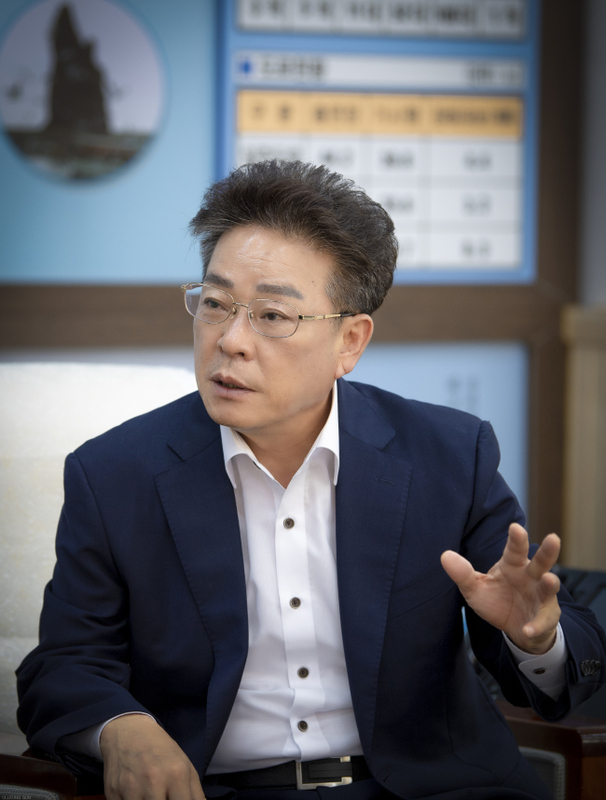 Kim of the main opposition Liberty Korea Party took office in July 2018 after serving as a member of the fifth and sixth Ulleung County council from 2006 to 2014. “Completion of the ring road is expected to have a profound impact on tourism, business and culture, among other aspects, offering a new level of convenience,” Kim said, expressing high expectations for changes the road would bring to the small island. The last part of the road was completed in 2018, 55 years after the project to construct the 44.2-kilometer-long road began in 1963. From 2011 to last year, a total of 138.7 billion won ($123.9 million) was invested in constructing the final 4.7-km part of the road that had been left incomplete for 10 years due to the complexity of building a road on cliffs and a lack of capital. Laying out details for each region of the island, Kim said the western region would become a history-themed tourist spot based on its historical and cultural importance, alongside existing museums, while the northern area known for its outstanding natural landscape would be touted as a “healing” attraction. Eastern Ulleung-eup, the center of the island’s economic and administrative affairs, is to become the heart of Ulleung County’s tourist attractions with the building and restoration of walking paths. “Ulleung County’s astonishing harmony of nature and people will become our pride and joy. I will make efforts to preserve and restore precious cultural assets,” Kim said. Ulleung County and Dokdo were nominated in the natural resource category of the 2018 Star of South Korea’s Tourism awards organized by the Ministry of Culture, Sports and Tourism and the Korea Tourism Organization in an effort to recognize contributions made to the country’s tourism industry. To enhance the value of the two historically and politically vital islands, Kim vowed to examine green energy facilities and unsanitary public facilities. Kim added he plans to continue the campaign encouraging the public to visit Dokdo and to expand the Dokdo academy for government employees, providing more opportunities for people to experience the island first-hand. Last year, over 350,000 people visited Ulleungdo, marking the fourth time since the county started taking tallies in 1980, the county said. Seeking to attract more residents to the island with a population of roughly 10,000 people across some 4,500 households, Kim laid out plans to boost job opportunities and increase income in its key tourism, agriculture and fisheries industries. “If we create jobs that come with higher incomes, it will lead to population growth. I am confident that Ulleungdo will be able to enjoy its second heyday,” Kim said. To create high-value jobs, Kim eyed new industries such as the meetings, incentives, conferences and exhibitions industry and spearheading the industrialization of the agriculture and fisheries sector. Local specialties of Ulleung County include squid, dried greens, Korean pumpkin malt candy, and pumpkin bread. As part of efforts to bolster infrastructure, Kim said all-out administrative efforts would be made to build an Ulleung airport, expand existing ports and roads, and attract large passenger boats. “I recognize this (expanding infrastructure) as a matter of survival, not a choice. I will solve this in unity with the county’s residents,” Kim stressed. Boats traveling to Ulleungdo are available at four ports across North Gyeongsang Province and Gangwon Province, but they are canceled 1 in 3 days on average due to harsh weather and sea conditions. “I will thoroughly complete my campaign pledges. I will listen to residents, and communicate and serve Ulleung residents to enhance their happiness,” Kim said.